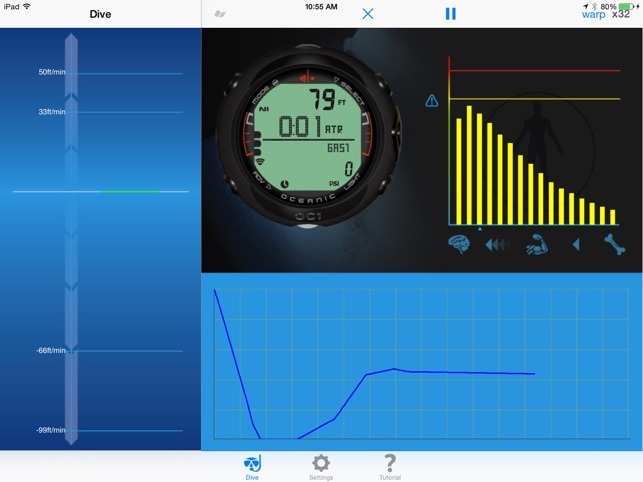 This is a user friendly App that transform your iPad into a model-specific dive computer. 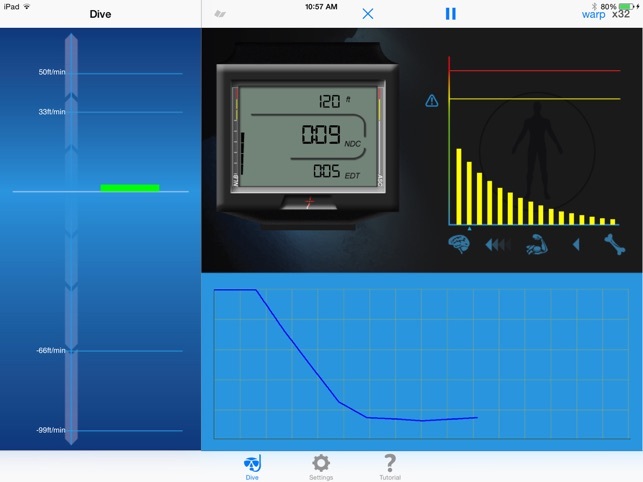 Thanks to our virtual depth sensor you can interact with your iPad with simple hand movements and make it descend or ascend in the water column and so create your own dive profile. While diving you can see the nitrogen intake and release of your body. And at the end of the dive, tap on the log icon to see a summary of your dive. 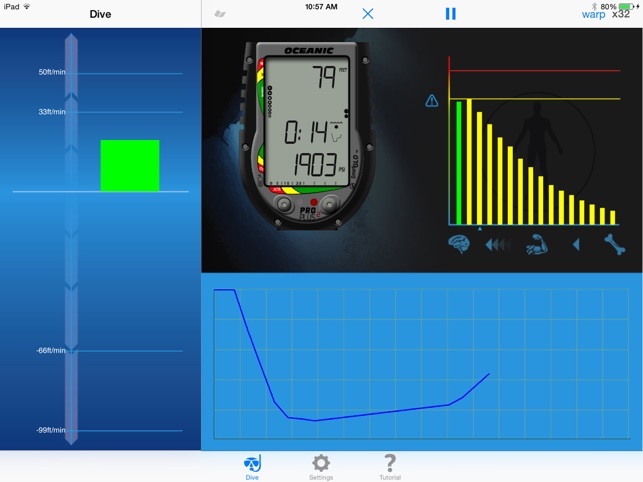 The iDive Computer HD App comes with a non branded dive computer, but you can customize it by purchasing, via inApp, simulations for model-specific dive computers of major brands such as Aeris, Cressi, Hollis, Mares, Oceanic, ScubaPro, SubGear, Shearwater, Sherwood, Suunto and Tusa. 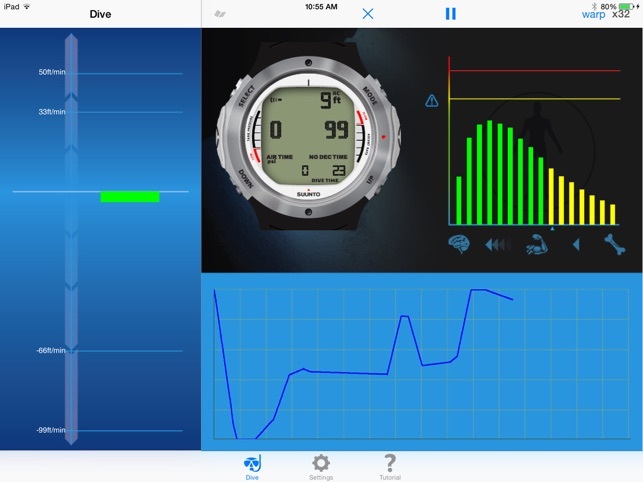 The iDive Computer HD App runs - in real time - our implementation of the Buhlmann ZH-L16C algorithm (moderate conservatism setting) and supports the most typical dive screens such as: surface, normal diving, entering deco, deco stop, deco violation, fast ascent alarm and post dive. 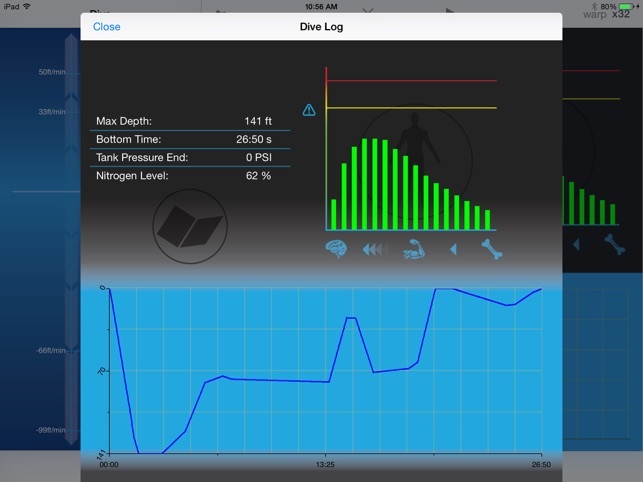 If you are a dive professional this is the perfect App to show a model-specific dive computer in action to your customers and/or students. 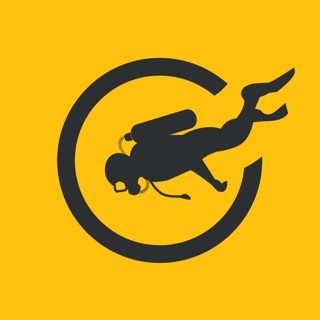 If you are a diver, this is the perfect App to refresh your skills before the dive season resumes, or in-between dive trips. Nice simulation. Don't fall for the in-app purchases though. The real dive computers are just skins. 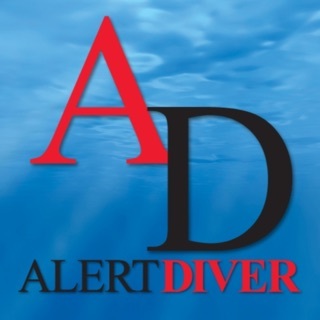 No additional functions beyond what's available to the generic dive computer. The dive log doesn't work on my iPad Air (yes, I pressed the pause button). Probably won't work on yours either. 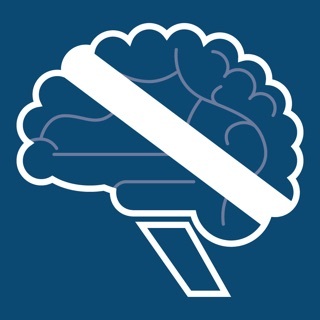 About par for a free app so no worries. There seems to be no point, you can not change the gas on the dive computer, or go deeper then 130 ft. If you want to simulate a recreational dive with in the deco limits on standard 21% air then ya this is good to go. 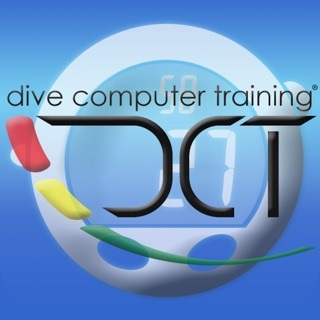 However, if you are looking to practice using your dive computer so that you know what to expect and be comfortable with the features of your dive computer your deco/tec dives this app is garbage. I paid $5 for the Oceanic V180 computer simulator. I can not cycle the function button on the dive computer. All this app allows the user to do is descend and ascend. The simulator only shows depth, nitro load, no deco time, and ascent rate. I know the V180 can display a lot more. This was a waste of money. Better off going to the store to learn the functions as this teaches you nothing.